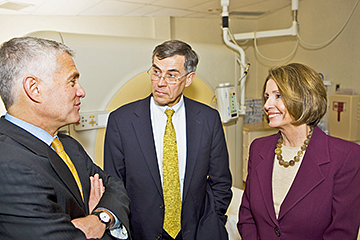 THE SPEAKER COMES TO PRINCETON: House Speaker Nancy Pelosi and Congressman Rush Holt visiting a diagnostic imaging suite during Saturdays tour of the University Medical Center at Princeton with Barry Rabner (left), president and CEO of the Princeton HealthCare System. At a brief press conference, the speaker urged support for the health care reform bill passed by the House and called the new hospital under construction an innovative model to the nation. Borough Council unanimously voted at last weeks meeting to draft new amendments that would reconfigure how the governing body oversees the Police Department. At its Thursday evening meeting last week, the Regional Planning Board of Princeton passed an amendment pertaining to the future of development and growth in the Borough and Township as it relates to educational and non-profit institutions, including Princeton University. Members of the Princeton Merchants Association (PMA) met on Tuesday to determine how the organization can better assist in bolstering business. It isnt 2010 yet, but Westminster Conservatory has already begun celebrating its 40th anniversary. A gala on November 1, featuring a special faculty concert, reception, and silent auction, kicked off a year of festivities with particular panache as students of piano teacher Ena Bronstein Barton donated $10,000 in her honor for a new endowment to support piano instruction. Other proceeds will benefit the student scholarship fund, faculty development, and instrument upkeep at the Conservatory. It is at once very well known, and virtually unknown in terms of what it does and who does it. What is it? When strolling past the Arts Council, it is hard to miss the giant sculptural forms frozen in twists and turns on the Michael Graves Terrace. There were plenty of reasons for the Princeton High football players to hang their heads after their Central Jersey Group III state playoff game last Friday at Monroe High. The Westminster Choir, conducted by Joe Miller, has had a very busy fall. Not only has Dr. Miller just released his first full-length CD with the ensemble, he is preparing the choir for an upcoming tour of California as well as a performance at the February 2010 regional conference of the American Choral Director’s Association. The premiere chorus of Westminster’s many performing ensembles, the Westminster Choir is comprised of singers who will likely have careers in vocal performance. Since taking over the choral program at the Choir College, Dr. Miller has enabled the Westminster Choir experience to be an active part of a student’s development as a soloist by his choice of some very challenging choral repertoire and his approach of having the students really singing out even as members of a chorus. This challenging repertoire and vocal style was very much in evidence in the Westminster Choir’s concert on Sunday afternoon in Bristol Chapel, as the ensemble performed music from both the recent CD and the upcoming tour. Sixty years and still counting! Nelson Glass & Aluminum is unique in Princeton today. An independent, family-owned and operated business that has continued to provide Princeton and the area with knowledgeable, friendly service and quality products, it has a proud history. Twentieth Century art and design is on display at the newly-opened a priori gallery at 16 Church Street in Lambertville.